The buttons on the pockets are found on many types of jeans. We all know that jeans are very important and many people wear them all the time. 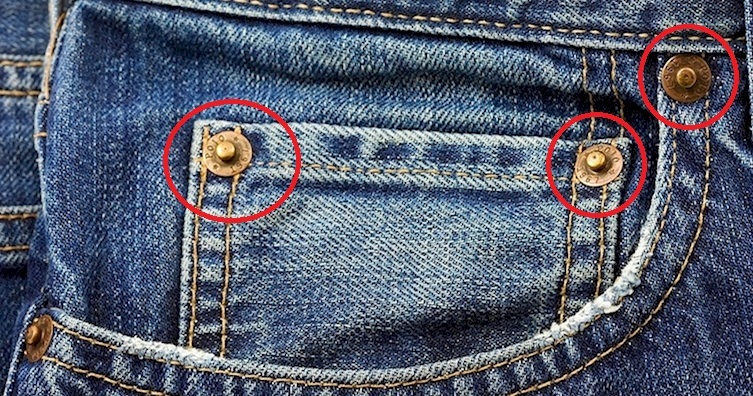 But, have you ever wondered why there’s a little metal button on the side of jeans pockets? If your answer is no and you don’t know, then you should definitely read the article below. We’ve found out some very important information about these buttons. You should know that these little buttons are actually known as rivets and prevent jeans from wearing out and ripping at the seams. These little metal buttons are patented by the jeans maker – Levi Strauss, back in the day when jeans were mainly worn by hard manual labor workers. Well, the miners complained about how quickly their trousers fell apart at the pockets – so, Strauss was forced to make metal rivets and they worked like a bloody charm.